PLEASE NOTE – to view alerts, you will need a username & password which we set up. Please follow directions below. The APP is free to download, but we still need to set up your account. Reminder, for all alerts, upgrade to a premium membership at $19.99 per year. Logout of APP and Log back in. Alerts should then work.Try these steps: Go to Settings > Sound & Notification > App Notifications. Select the app, and make sure that Notifications are turned on and set to Normal. While most news sites are moving towards paywalls to raise revenue, we are offering our ECTNow APP as a way to help keep the site running and providing you with a community benefit. 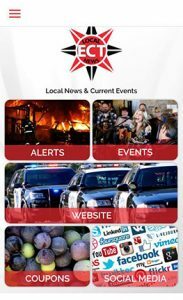 The eastcountytoday mobile app “ECT Now” is aimed at bringing local news in Contra Costa County directly to your phone–available on both APPLE and Android phones. Whether you are looking for traffic updates, police and fire activity or community information, this app will provide it. The APP is free to download and you may request a “basic” account at no cost. Or, you can offer a donation to ECT and become a premium user of the account. And for your support, we will send out additional alerts and offerings to our premium users. As a premium user, you are helping keep the doors open at ECT. of the ECT Now app, you will get alerts directly to your phone around Contra Costa County. The service is $19.99 per year. Hit “subscribe” below and upon completion of payment, we will set up your account credentials which will provide access to the app. These credentials will be emailed to you. Note – emails will go to the email associated with your paypal account. Also, be sure to check your spam folder. Once you sign up, you will be added to our email list for updates on status of app and general information. Our premium membership will allow you to receive ALL our “Push Alerts” which are Breaking News Alerts directly to your phone. As a premium member, you will also be able to chat and receive special offers. Typical alerts include traffic updates as well as notifications to police and fire activities to avoid the area or simply let you know why sirens are blaring. The mobile app will allow you to receive alerts without having to utilize our website, social media platforms as it comes directly to your phone for easy convenience. After payment — you will be directed to the link where you can download the APP. ECT will then get an email and will set up your account within a 24-hour period (hopefully within a few hours). We will then email you back your username and password for access. Is the APP free to download? Yes, the APP is free to download on both Apple and Android. You will also be added to our email list for events and other news. Are login credentials required to have access to the APP? Yes, they are provided by email for premium members who sign up. The email associated with your account is based on your paypal account email. Is there a “donation” cost to use the APP? Yes, the app s $19.99 per year. All payments are made through PayPal at this time. Can I select the types of alerts I want to receive? We originally had categories for our alerts. Based on the types of alerts we “push out” 95% of our audience wanted all alerts. Now we have a single category. Are alerts sent at all hours? Yes, with the caveat that we try and respect “off hours” and a majority of the alerts are sent between 6:30 am to 10:00 pm at night. Given the severity of some incidents (police activity, fires, or traffic crashes) alerts could be provided at all times should they have a major impact on a community. I am logged in as a premium member but do not see any of the alerts? Simply logout and re-enter username & password. You can logout in the “Settings” Tab. Also, make sure your phone settings has alerts turned on.For Android Users: We also recommend double checking the push notification settings on your Android device to ensure notifications are turned on for the app.Try these steps: Go to Settings > Sound & Notification > App Notifications. Select the app, and make sure that Notifications are turned on and set to Normal. Can I login as a guest? We cannot cancel your account (even if we wanted to at your request) due to a papal process. Login to your PayPal account and go to your pre-approved payments and click update. Then click the details and cancel the reoccurring payment.